Shows LIVE sports scores, updated every few minutes. Keeps you current on all the latest games, scores, and more! Sport Logo (NBA/NHL/ETC) takes you to that sports web site. Clicking on the TILE Background takes you to the Details of that Game. 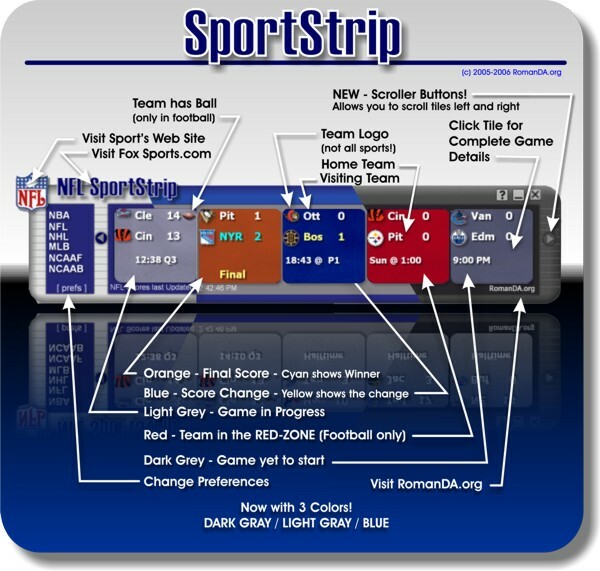 SportStrip Title Takes you to Fox Sports Web site. The best time to use this is while there are live games going on! PLEASE NOTE: This is a DEMO version and is set to expire 15 days after install. Have things changed here at Wincustomize??? I can't ever remember downloading a "trial" version of a widget before, let alone one that I'd be willing to pay for, unless it were spectacular, which this one isn't. If you want to be payed for your work, try placing this over at desktop gadgets, there I think you may get a one time fee, or something similar. My appologies, I see that this widget is up at Desktop Gadgets, however, when I first load the widget and click on the "purchase" option, it opens www.desktoopgadgets.com, which of course gives the "page cannot be displayed". In any event thanks but no thanks. 1. Things are headed to a better place where programmers/skinners can help expand the DX /WC world with a lot of GREAT new items. 2. Well, Trial versions are all over the internet. This one in perticular allows you COMPLETE access to the ENTIRE program for 15 days, more then enough to decide if you like it or nont. 3. Well if you dont think its "Spectacular" then no one is telling you to BUY it, see, trial version worked. You got to use it, see if it was for you, and it wasent, so you can just delete it. 4. This is on DG as a Demo and a Full Gadget, my purpose here was to allow more people (that might not go to DG to see and test out my work). 5. I am glad you pointed out the bad URL, it has been updated with a correct URL. But thats your perogitive, and no one will make you use something you dont want to, or buy something your not interested it. But, there are a LOT of poeple who seem to like this, and have purchesed the FULL version. NP, Im sure there will be updates when Baseball is back in "swing"
If you are running 1.19 or 1.20 version and it doesnt show as TRIAL VERSION but shows as FULL VERSION you are running a version that has been hacked and could possibly contain a virus or spyware. Please remove this version ASAP. Re-download the 1.20 TRIAL version. I THINK ITS GREAT FOR SPORTS FANS LIKE MYSELF! I have not updated the "FREE" version since it was hacked. Sorry.. no real plans at this time to update it. I really like this - exactly what I've been looking for - especially with baseball season right around the corner. But there seems to be a problem with the links: I click on the MLB logo and get the NBA site, click on the NCAAB logo and get the NCAAF site. Clicked on the Kansas - UCLA game in NCAAB and got the Avalanche at Coyotes NHL game. Are these errors because I'm only using the trial edition, or is this what I'll get if I pay for it? Fix these (if necessary) and you've got a great gadget here. I will look into redoing the FREE version, the Full version is working fine (or trust me people would be telling me..lol). This version is about a year old, and i have made a lot of updates. to buy the full program. full version wont work for me...is it because of vista? It could be Vista, as I have not verified it works with it. if i just run the .exe, it crashed "this program has stopped working"
if i want to im port it as desktopx object or widget, it says "doesnt seem to be a valid desktopx package"
You cannot import it, its a GADGET. Email me, and i will see if i can help.